I'm in the bad books. Had a nice chap at he door asking for my eldest daughter who left home five years ago. I knew what he wanted. I did his job for a while some years ago. I've also had five years of phone calls and letters about her debts. "Is it this address, or this one?" he said tapping a printout. As it happens, she lives a couple of minutes away at a similar number and road name. Right. I thought. Time to do the Dad thing. "That one" I said. "Yeah, similar, aren't they?" Predictably, the phone rang five minutes later, and I'm the biggest barsteward in the universe. "Bailiffs will burst their way in and even price up and take away baby's toys! They'll take me to court. That's what happened to Mrs J who used to live next door, and they've had to move house twice to avoid them! You should have told them I was a previous tenant!" Uhuh. I'm sure Mrs J. did. There's an element of truth in that. No, they don't take away the kids toys. But if you invite them in they will asses anything you have deemed to be of value at one third the retail value. Like your kids Xbox, TV and PlayStation. A bailiff in the uk, which is a last resort, can only enter your home if you invite them in. If they "burst in" it is entering illegally, and you are quite entitled to call the police. But as I've explained, it can be avoided if you talk to your creditors, you fill in a means form detailing your outgoings, and make an arraignment to pay, if only it's a couple of quid a week. If you are on unemployment benefits, there is a limit to what they can ask for. Debts are bought and sold between companies. The original creditor recovers the amount they loan at a small profit. The credit buyer attempts to recover that debt with their incurred costs on the information they can glean. They will get information from the electoral register, names and addresses sold between companies, whether that's Tesco Club point schemes or 192.com or other creditors and banks. Buying and selling names and addresses is big business. Being taken to court for debt is awful and stressful but like divorce, it is not a criminal offence. But if you take out loans or obtain goods and/or services on credit and you won't, or refuse to pay up, it is fraud. If it's down to genuine need, any hassle can be avoided. Talking to creditors is a good thing, because it can help you learn how to structure finances and budget. Burying your head in the mud gets you nowhere. It would seem I've become invisible again. Quite a useful ability. Sort of. Quite used to people talking over my head, or people knowing I'm there and not quite knowing how to refer to me. The wheels make them uncomfortable, and Stroke means brain damage, brain damage, they infer means there may be some intellectual deficit. But that's ok. I can put them at ease. But sometimes, I can be truly invisible. Try this. "Sometimes your bloke can be quite deceptive" someone said to Bear. "he comes across as real quiet, almost submissive. Then he kinda comes at you if he doesn't like what you're saying" Nah, I thought. No problem with that. The lady in question was six inches away. I stood up. "Coffee?". No answer. "Bear?". No answer. Wobbled into the kitchen, Made three tea's, plonked them in front of them. Sat down. "Has he got a facebook account?". I leaned over, tapped her on the shoulder. No, I don't. Would you like sugar? The poor lass turned white, jumped out of her chair, knocking it over, and fled. Bear blinked a couple of times, frowned. "Is this mine? Ta love. Were'd she go?" Where indeed. Last night, Bear found a 'zebra finch' with what appears to be a broken leg. It's not unusual for zebra finches to be found in the wild. Or birds to be found injured. I've found the best way is to keep them with some food and water in a bird box, in a warm dark place until the RSPCA can collect them. But to be honest, the success with wild birds is not good, even if you know what kind of food they eat. Even if their injuries seem survivable, stress kills them. So I was surprised when this morning she said it was still alive, and an hour ago it was singing. That's no bloomin' zebra finch. I'm very disappointed with the RSPCA. We've been given 3 collection times, and even been told to release it back into the garden since last night. Have they turned up? Have they heckers like. Look at the poor lad. 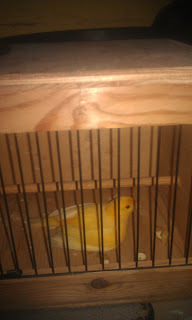 I don't know a lot about birds, but that is definitely a domesticated canary. I feel he's a male, but he's in a presenting position. I know his metabolic rate is high, but he's panting more I sense he should do. The signs are all wrong. Help? I'm not very good with critters in cages. I relate too easily. Forgive me. I know this is corny, but I was looking at yon cutie, and thought - Twitter. I know. I know. So I grumbled at @RSPCA and a nice young lady turned up within 15 minutes. 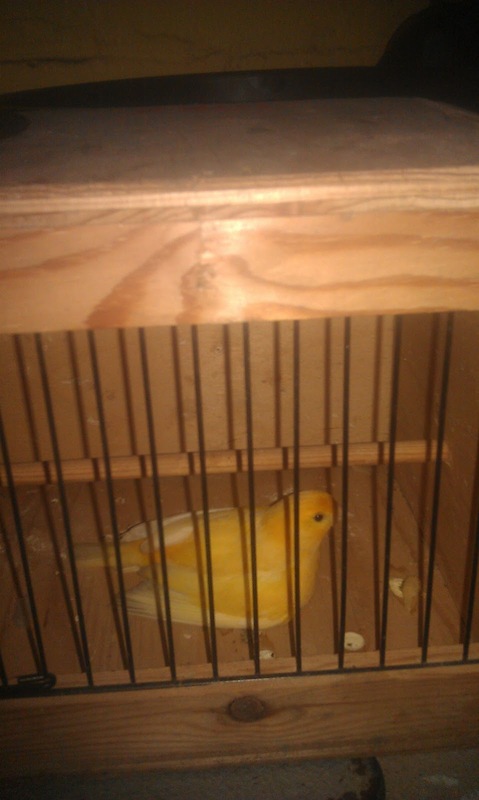 "That's not a Canary" she said. "It's a yellow Finch". Ah, I thought. Read my Tweet then. Anyways. He's off. I get some odd requests. "Can you carve a stone age style lamp, as authentically as possible, using only locally available materials, using the original methods?" 'Course I can. But it's going to take some weeks. The main words I'm looking at here are 'authentic' and 'original'. The discoveries of oil lamps are mainly oil stone shale or soap stone, both of which are soft and easily worked and polished, and much later variations are wooden. Something like this. This is clay, and more ornate. The very early examples were carved using whatever tools were to hand. Reindeer or bovine horn that had been hardened. The basic idea is that you need a bowl, with a channel leading off it. 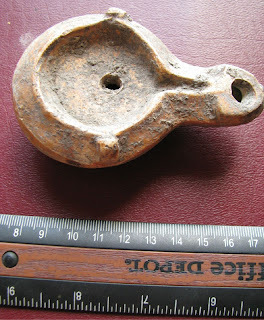 The bowl would be filled with tallow, which is animal fat, into which is laid dried wicks that can conduct the fat by capillary action - the fat soaks the wick. That the wick burns is incidental. The fat or oil soaks up the wick and the heat vaporises it, and the vapour burns. In other words, it's a captive candle. They're stinky, smoky, and I love them. There's a very strong possibility that the soot they produce led to early art and communication. So why is it going to take weeks? Notice that phrase 'local materials'. Here, it's sandstone shale. It's some millions of years old, and quite tough and can flake. Sandstone is absorbent, so I'm going to wax (another type of tallow) to soak and seal it. Secondly, there's a remarkable lack of reindeer around here, and hardening cow bone from the butchers needs intense heat for hours. Neighbours don't like the smoke or the smell. Spoil sports. Chisels and power tools are out. So I'm using this. 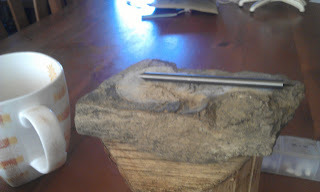 A tungsten carbide shaping tool. Before you cry - oy, that's cheating. No it ain't. 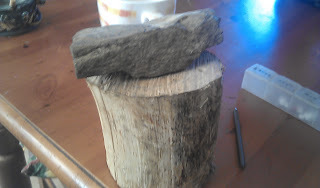 I'm using locally available materials and the hand tool available to me, just like our ancestor cousins, and weeks and weeks of patient forming. Sure, I could whip out my dremel and chisels. I could knock out a replica in an hour. But I'd know I'd done that. Dunno about you, but the research, effort and patience has a much greater personal reward. So I'll be sat in front of the telly, carving block on my lap, doing a tiny bit of the time. Incandescent bulbs are banned in the UK for domestic use by the European Union. Major supermarkets stopped stocking them a couple of years ago, though you can still find them at some independent shops. Once present stocks run out, that's it. Or is it? Heck no. for about £1-£2, half the price of their so-called energy saving alternatives, you can still by them if you ask for 'rough usage' - industrial use bulbs can be purchased online or companies like Maplin. Industrial use is exempt from EU regulations. It's one the strengths of being British. Look at the rules and find a way around them. Another example. Sprinkling coffee grounds around the veg patch to deter slugs and snails has been around for years, and it works. According to the EU though, if you are caught doing it you are open to prosecution. That's because they are being used as a pesticide, and unless it's on the approved pesticide list, it's illegal. Coffee grounds were never tested. So they're illegal. The way around is the compost them. That way, it's legal. In the vague chance that like me, you mentally automatically convert between 'new' and 'old money', (I'm not paying 15 bob for that!) or grams and pounds and ounces, you might wonder why everything is in grams, and if like me you use so-called old fashioned scales and you have to convert. Legally, supermarkets believe they have to display grams. Not so. Pounds and ounces can be displayed, as long as its alongside metric. The real reason they don't is because it's cheaper to print out the labels in metric. 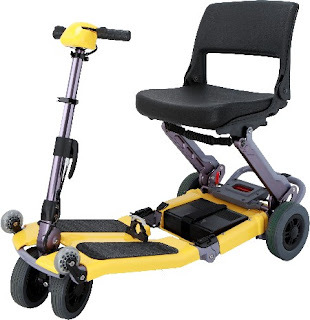 I'm going to have to grudgingly admit after that all these years of doing my best to avoid using the infernal machine, aka, the wheelchair, I'm just going to have to bite the bullet and just do it. I have bits and pieces that refuse to work, or work as they should, and I think it's been long enough now that I've realised they just aren't going to, and I'm stuck with it. Not that there's much wrong with them. It's bits of the control centre that are jiggered. I've learned to have an enormous respect for the human brain - and mind - and it's ability to rewire and rediscover itself. That takes time, and a very long time. In many ways it's a good decision. It's very important for my self respect and confidence to regain much of the independence I've lost over the years. There are some down sides that are mainly functional. By taking back my independence it's going to worry the heck out of those who have cared for me. My right hand side is a bit of a problem. It's much weaker than the left, and there's the very real risk of going around in circles. Sure, I can get someone to push me, which around here would be useful as I'm surrounded by steep hills. But being propelled around defeats the object - independence, right? So the constant place and traffic awareness is going to be a challenge, but I'm up for it. The general public? Entirely positive I've found. Helpful, courteous and accommodating. To be honest, as a wheelchair user, you learn an entirely new etiquette. People really do want to be helpful, and want to help even if you don't need it. You somehow feel churlish refusing a heartfelt and genuine offer of help. I've only refused on a couple of occasions, and instantly regretted it when I've seen the hurt in their eyes. Teenagers are the best. Whatever the reason, they cheerfully breeze in, and just do their thing, unasked and without asking. They're marvellous. A possible solution is something like the Luggie motorised 'scooter'. I wouldn't have to depend on others, and hills would be a doddle. The downside is the eye watering cost. £2,495 if I want armrests? Good grief. Tell you what, poor Bear went saucer eyed and her bottom lip stuck out when she saw that price. That, by the way, is a good price. Not at all unusual. Is personal independence worth at least two and a half grand? When you've lost it, Oh, yeah. Yes indeed. In case you are wondering, I'm on lower rate Mobility, (about £17.50 a week) because the Department of Work and Pensions in their wisdom decided that since I don't get out much, I didn't need Higher rate. You couldn't make it up. If I had that, I'd be able to get one under the Motability scheme for around £49 per month - payable forever. May I please refer you to an excellent blog post by Sue Marsh, What DLA means to me, where she sums it up beautifully. The comments are also well worth a read. The Wheelie isn't too well today. Entirely self inflicted. Hadn't had a beer for a long time, so I took a wobble to the local shop with the Bear. Mistake number one. These boots may be made for walking, but the spindly things dangling below Mr. Potato Man seriously objected. Having survived that, I had a couple of cans of lager, then Bear stuck a rather large glass of Cidré in my hand. I forgot my misspent youth, whereas one mixes lager and cider to produce a 'Snakebite'. I didn't, but follow a lager by a cider is the same. Snakebites are the root of all evil. I don't do hangovers, thank ye small gods. But this morning, urggghhh. I'm under orders, apparently, to walk with my Bear to the local Asda. It's no further away than the shop. I've acquiesced, but I don't want to go. However, I'll give it a shot. The hardest part would be walking around the store. If you really thought about it, it's amazing how much time you spend on your feet while wandering around a supermarket. Luckily, they provide in store wheelchairs, so I think I'll use one. I'll be embarrassed to, though why I couldn't tell you why. I have a funny feeing this wheelie is going to sleep well tonight. I find the local Asda quite overwhelming, all that space and so many people. Though the shoppers seem to follow an unspoken etiquetté . There's quite a lovely choreography how they and their trolleys weave and maneuver around each other. An unspoken politeness and courtesy. There's hope for us Brits yet.